who has made this page possible. Workman turns up Roman coins hoard. Whilst preparing the drive of 2 Cedar Rise a hoard of Roman coins showed out as a workman thrust with his spade at what he thought was a flint. The scene was a four-acre development called Walnut Tree Farm on which there are almost completed bungalows, Mr. Wilfred Tyrrell, aged 42 of Globe Place, Norwich, the builder, and one of his men, Mr. Charles Lovick, 24 of Park Farm Cottages, Whinburgh, were levelling and edging a driveway that a digger rough-cut some weeks ago. "I went into the building for a rule but when I came out Mr. Lovick called me over and said , 'Whatever are these ?'" said Mr. Tyrrell at his home last night.
" I could see there was a load of what looked like green washers, I thought they were electrical washers. But I took a second look and found they were Roman coins, bronze ones they looked. "Mr. Lovick told me he had been cutting away with his shovel at what took to be a lump of flint. It turned out to be a pot, which broke, and these green things spilled out" The two men put the pot and the coins into a bucket. The discovery was taken to Norwich Museum and yesterday Miss Barbara Green (Keeper of Archaeology) and assistants went to Mattishall to examine the site and take statements. They have already ascertained that these were in fact silver coins, dated the third century A.D. Some were clogged together in a lump. At Mattishall the experts came across a few more coins and some pieces of the pot, which is also of Roman origin. No skeletons were found. Miss Green said it was not possible to place any value on the find, which has been reported to the Dereham District Coroner. The British Museum has been informed and it is not yet known which museum, Norwich or British, will undertake the task of cleaning the coins. The third century was a time of troubles, with Saxon raids and political upheavals explained Miss Green, and therefore it was not unlikely that somebody had decided to bury their wealth. Also on the Walnut Tree Farm site Mr. Tyrrell yesterday found some very old bricks which looked to him to be the base of a hearth. is now home to the Mattishall hoard. Trade and the use of money became increasingly important during the Roman period. Coins were regularly used for everyday purchases at the times when this hoard was buried. This hoard was discovered at Mattishall, west of Norwich. It was found inside the Roman globular greyware pot. The rim was broken off due to ploughing. Altogether 1,080 coins were present. They date from between 145 AD and 260 AD. The earlier coins are called denarii and the later ones are radiates, named because of the crown of sun's rays worn by the emperor on each one. Hoards were often buried to store good coins when new, poorer, debased coins entered circulation. They were also hidden during times of trouble. In Roman times banking was much less common than it is today. Thrifty citizens usually made their own provision for safekeeping of their money. This normally involved burying it inside a pot at a secret place. However, they didn't always remember where they left it ! Barbara Green, B.Sc., A.M.A. & T.H. McK. Clough, M.A. On Thursday, 18th January 1968, a hoard of about 1100 Roman Silver denarii and antoniniani, concealed in a pottery jar. was discovered on a building site at Mattishall, near East Dereham, Norfolk (N.G.R. TG 04881115). The coins, having been cleaned and identified at the Castle Museum, Norwich, were declared Treasure Trove at a coroner's inquest held on 12th February 1968. This short account is designed to place the hoard within its archaeological context; it is hoped that a fuller numismatic publication will follow. The hoard was discovered by Mr. W. Tyrrell and Mr. C. Lovick while they were preparing the side of a driveway leading to garages for bungalows on the Walnut Tree development site near the centre of Mattishall village. Mr. Lovick directed a blow of his shovel at what he thought was a flint; this broke and disgorged about two hundred coins, which were coloured green by products of corrosion. Together the two men lifted the lower part of the pot, which contained the remainder of the coins fused together in a solid mass. Realising that the discovery might be of importance, but unaware of the true composition of the coins, they brought the pot and its contents to the Castle Museum. On the following day, the writers of this report were able to visit the site investigated the immediate area of the find. It was clear that the pot had been buried in a shallow pit which cut slightly into the natural boulder clay. Fragments of other Roman vessels and a small quantity of burnt daub were found in the pit fill, which was somewhat darker and different in feel to the surrounding earth; no objects of later date were found other than a fragment of coarse brick. Both the size of the pit and the nature of the fill, despite the presence of other sherds, indicated that this fill was not an accumulation of domestic refuse. The evidence pointed to the pit being dug specifically as a place of concealment for the hoard. It is possible that the other sherds were placed in the pit around and above the vessel to protect and cover it; they may, on the other hand, represent a meagre scatter of surface debris which was shovelled into the pit when it was filled immediately after the deposition of the hoard. With the exception of this pit and its contents, no sign of Roman domestic occupation were noted. The state of the site, which had been much disturbed by the activity of mechanical diggers during the construction of bungalows, paths and driveways, made further investigation outwith the immediate area of the pit impracticable. The buildings of the present village are likely to obscure any further evidence for Roman occupation in the vicinity; however, it is possible that Roman material may be found in an adjacent garden. 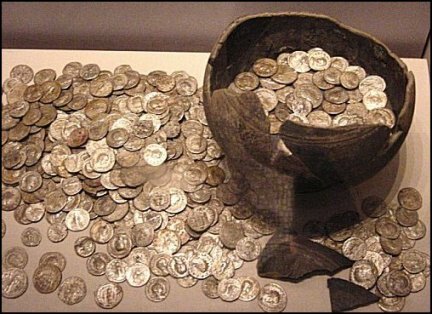 The hoard consists of 1095 coins and a number of fragments from a further fourteen or fifteen coins. All are denarii and antoniniani; they range from Antoninus Pius (A.D. 138 - 161), whose earliest coin is a denarius of A.D. 154-5, to Postumus (A.D. 259 -268), whose latest closely datable coin is an antoninianus of A.D. 260. Most of the coins were minted in Rome, but the following provincial mints are also represented: Antioch (Elagabalus, Severus Alexandr, Gordian III, Philip I), Emesa, Syria (Septimius Severus), Laodicea ad Mare, Syria (Septimius Severus, Julia Domna, Caracalla), Lugdunum (Lyons) (Valerian I, Gallienus), Milan (Trajan Decius, Trebonianus Gallus, Volusian), and a mint in Asia Minor (Salonina). The following list records the emerors and members of the imperial families whose coinage is represented.